Comments: This pair of black ducks was mingled with some Canada geese and mallards. 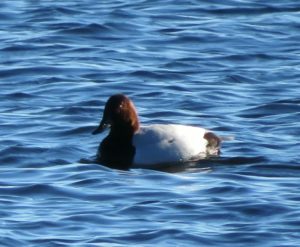 Shooting photos of this pair reminded me of my grandfather, who lived on Cape Cod and used to shoot black ducks for food during the first half of the twentieth century before I was born. 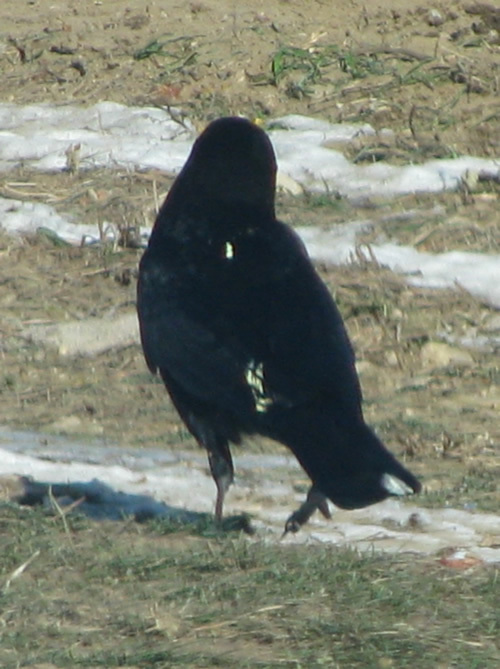 Comments: This mutant crow has a few white feathers mingled among the normally black feathers. 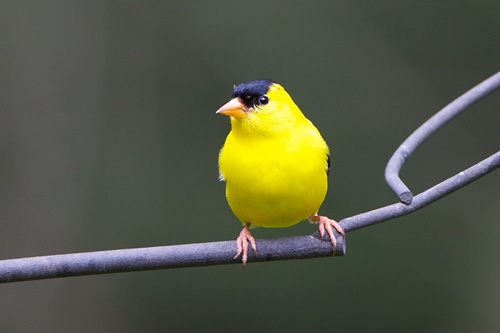 Comments: This common finch travels in groups. 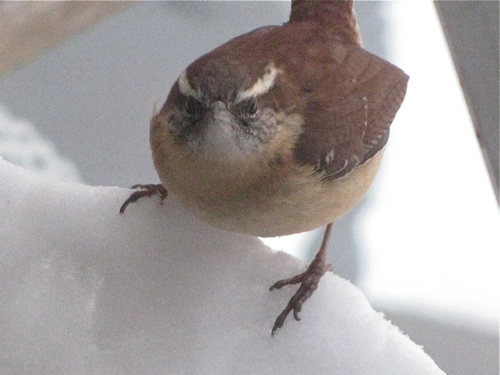 Its song sounds like “per-chick-o-ree, per-chick-o-ree” interspersed with an occasional mewing sound. Comments: The first photo is of a female; the second a male. Comments: Originally spotted by Valerie White while canoeing on the lake. 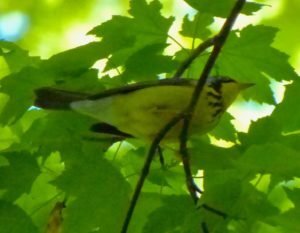 This is a rare bird in Massachusetts and a possible first record for Norfolk County. It was there for about a day and a half. Phone-scoped picture. Another photo can be found on Flickr. Comments: The “peents” began at 5:45. 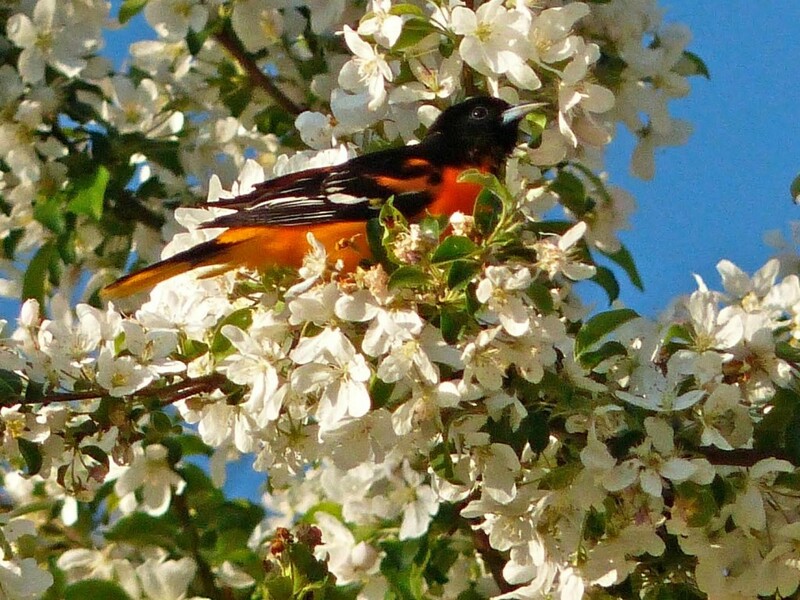 The spectacular mating flights began about 6:00 p.m. 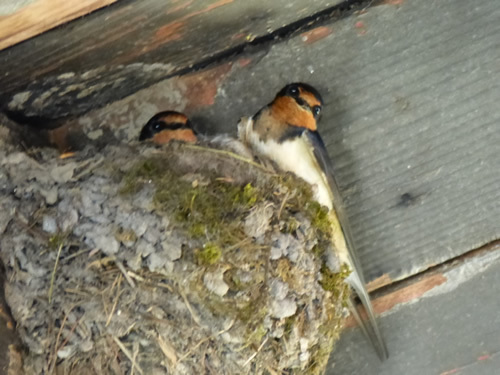 They will continue every evening at dusk (getting later as the days grow longer) for another month or so. Call me at 781-784-2986 for more particulars on when and where to observe the woodcock mating flight. Comments: Adult, big guy, plumage very clear. 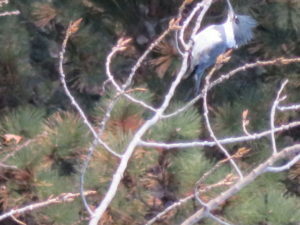 Perched 35 ft up in a tree, then took light toward Community Ctr. Positive ID! 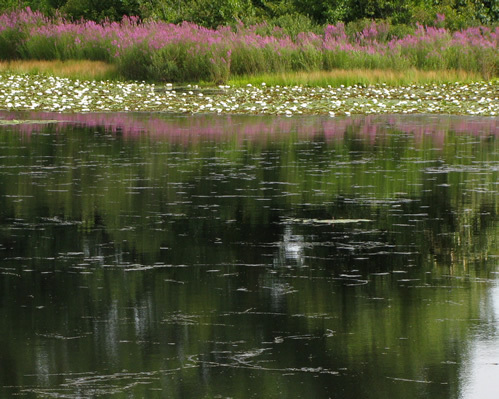 Comments: Large bird with white head and tail feathers spotted over Lake Massapoag. 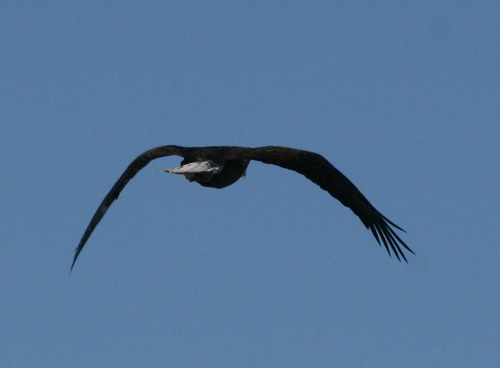 Unquestionably a bald eagle, it was seen riding the thermals before the clouds rolled in and covered the sun. 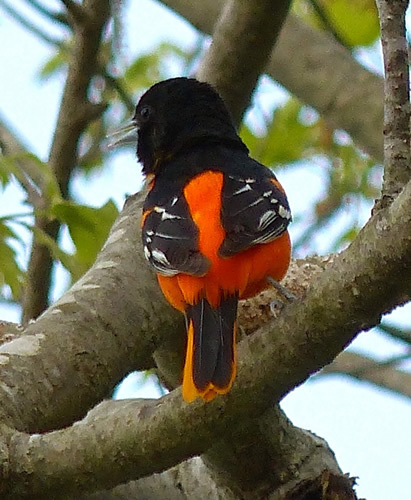 Could this one be scouting a good spot to nest? 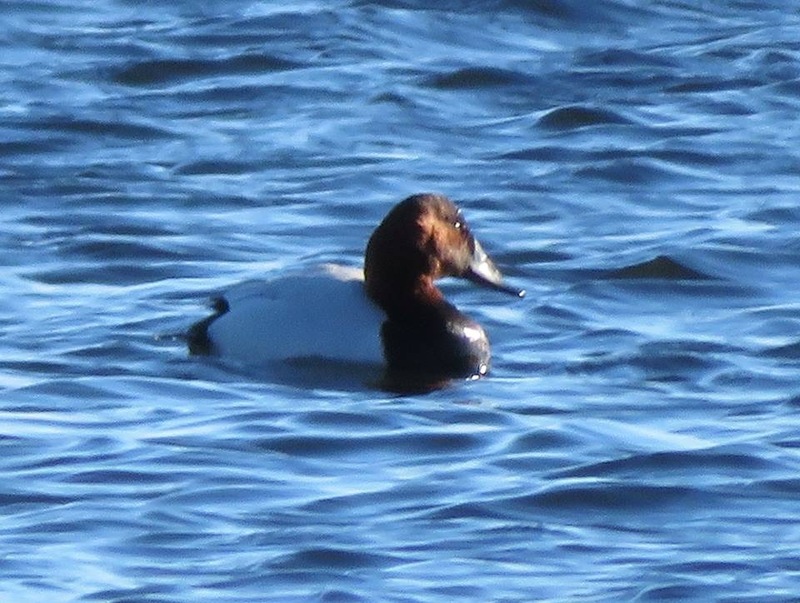 Or was it just looking for something in the lake to eat? Comments: While drinking hot chocolate after a morning of sledding, four of us clearly saw a bald eagle fly over our backyard. 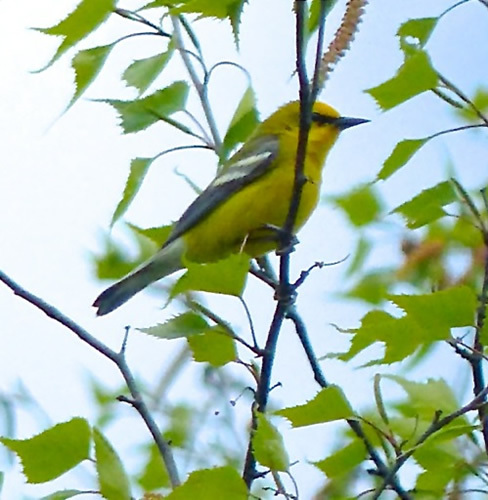 It was flying from Lake Massapoag toward the woods. 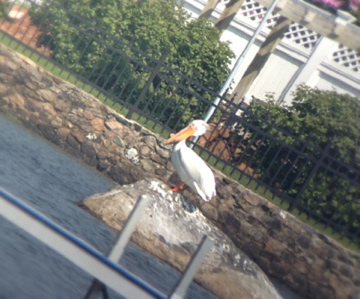 Comments: Eating carrion on the lake just beyond Pond St. on Massapoag Ave. 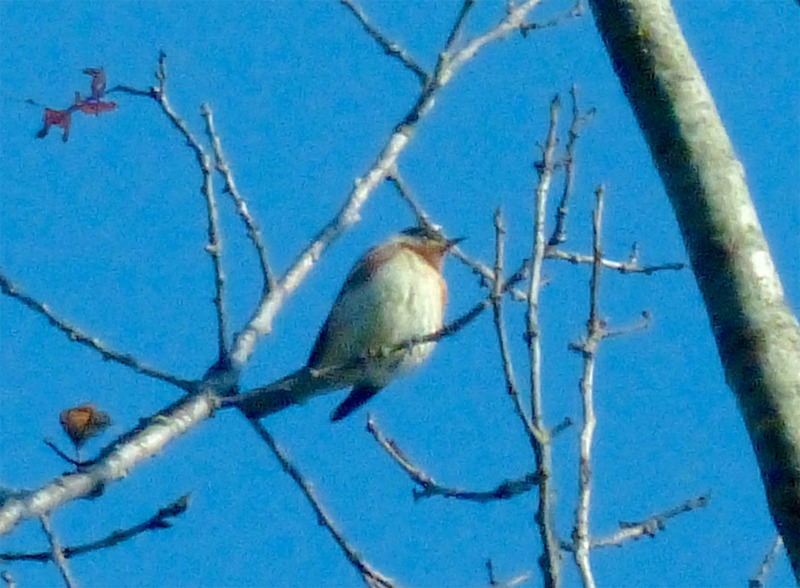 Comments: Definite ID from about 200 ft away. Eagle was flying. 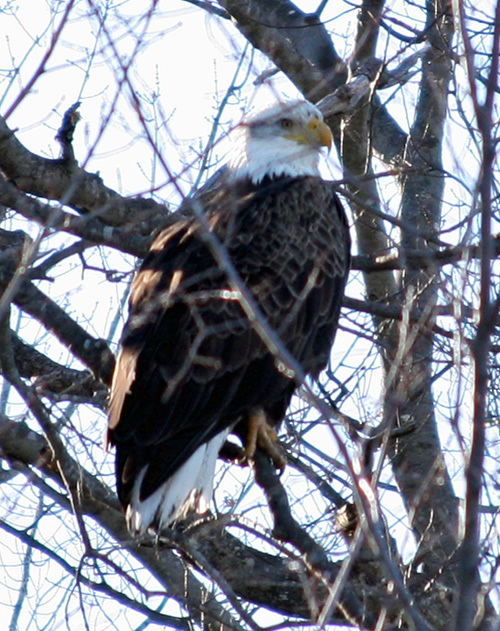 Possibly a second eagle further away. Did not get picture. Comments: He was flying down near the edge of lake, it looked like he was going after something on the edge of the lake. I was shocked and thrilled to see him. Comments: Adult with white head and tail. 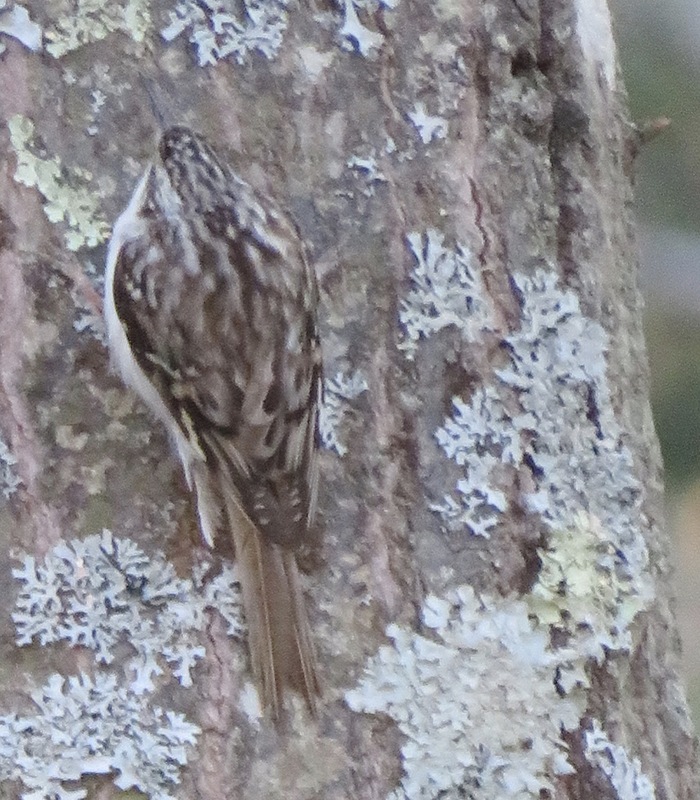 Very distinctive! 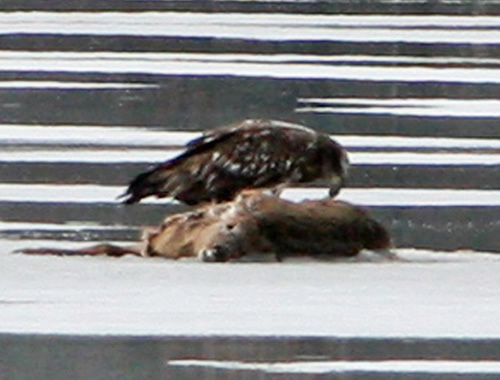 Comments: A young bald eagle feeds on a deer carcass on the ice. 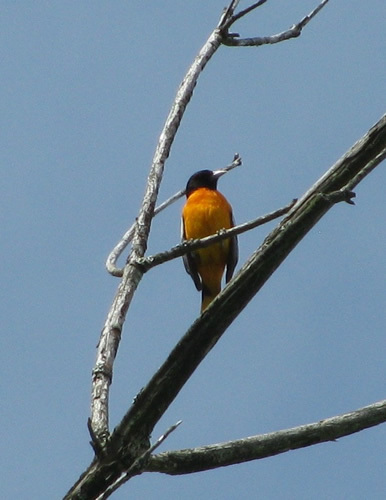 Comments: I’m told this is an immature male oriole. Unusual to see in November. 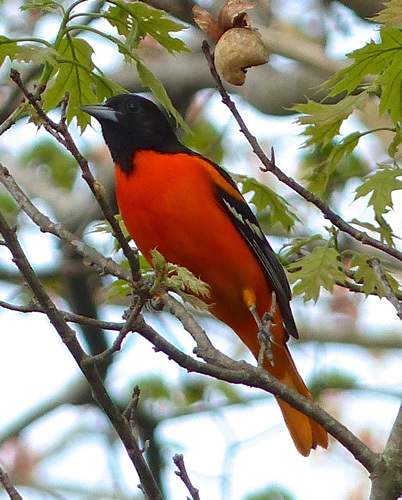 Comments: First I heard the flutelike call, and then I spotted the brilliant orange oriole in an oak tree just pushing out its first leaves of spring. Even though it was 7:00 p.m. and the sun was low, the bird fairly glowed. 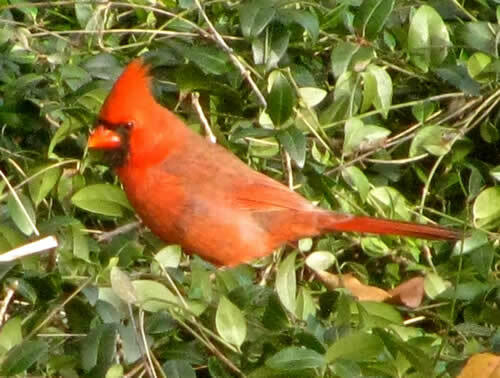 I wonder how such a gaudy creature manages to escape the notice of hawks. 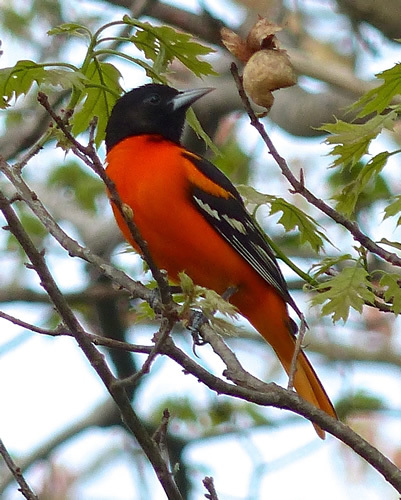 Orioles weave hanging nests, and feed on fruit, nectar and insects. 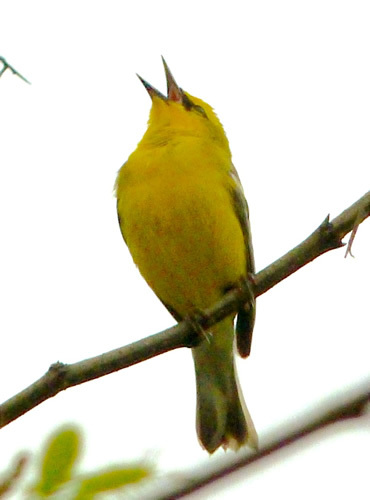 They have a counterpart in the tropics called a troupial, which is slightly larger, but sings an uncannily similar song. 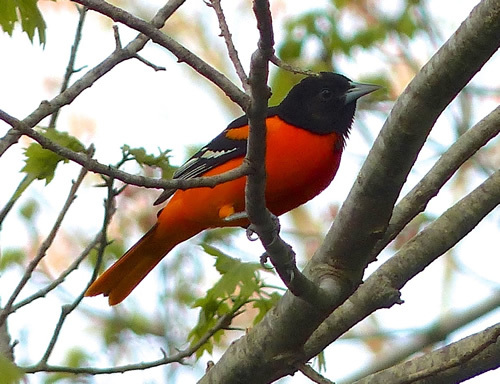 Comments: Orioles weave a unique hanging nest. 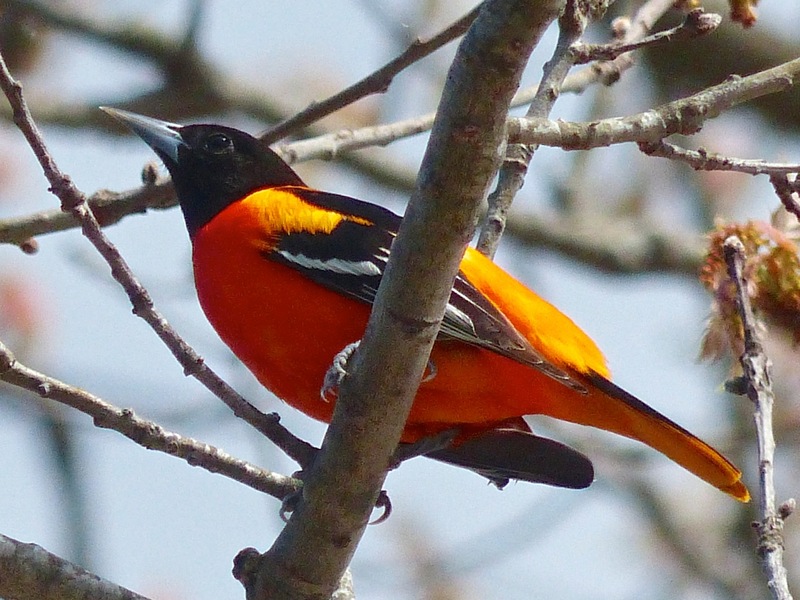 Comments: Baltimore orioles are among the most brightly colored birds found in Sharon. 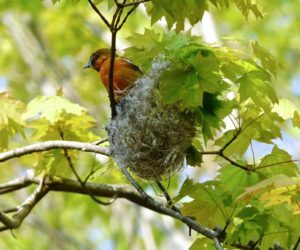 They weave remarkable hanging nests. 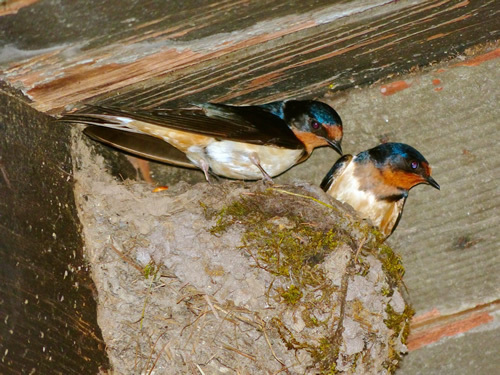 Comments: Barn swallows are passerine birds, which includes more than half of all bird species. 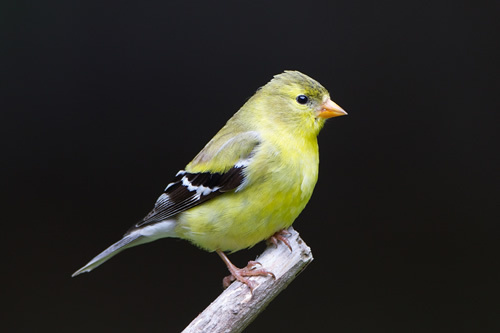 A passerine bird has three toes pointing forward and one back. This facilitates perching. The passerines form one of the most diverse terrestrial vertebrate orders, with over 5,000 identified species. 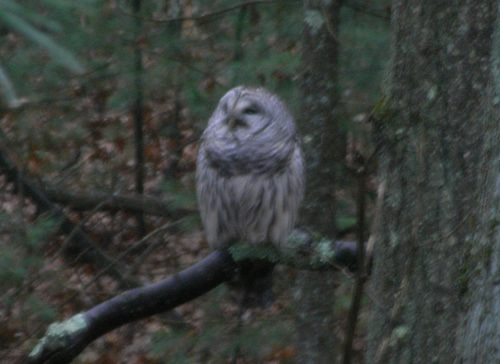 Comments: This owl sat on a branch close to the road for an hour or more, not bothered by people watching close by or by chickadees constantly scolding. Comments: Bay-breasted warblers migrate through Sharon in May en route to their summertime breeding areas in Canada. 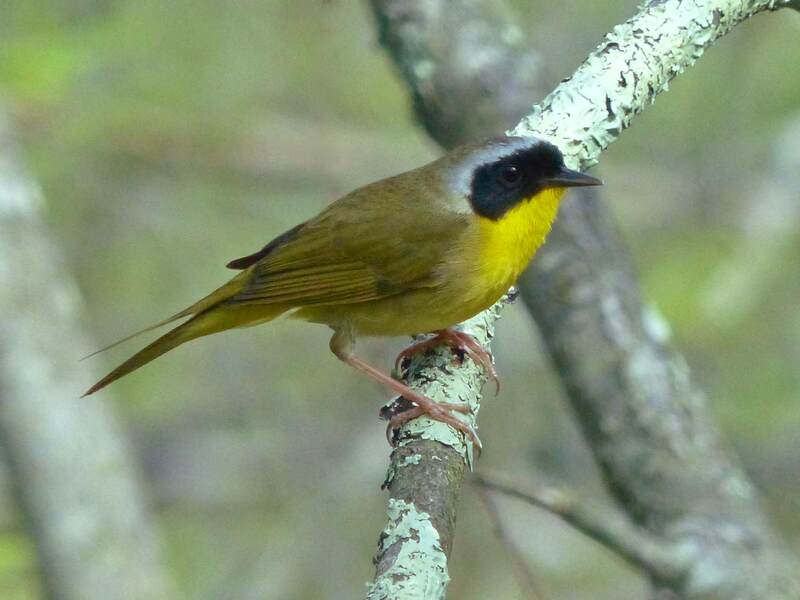 They eat insects and spiders to keep up their energy during the long flight. 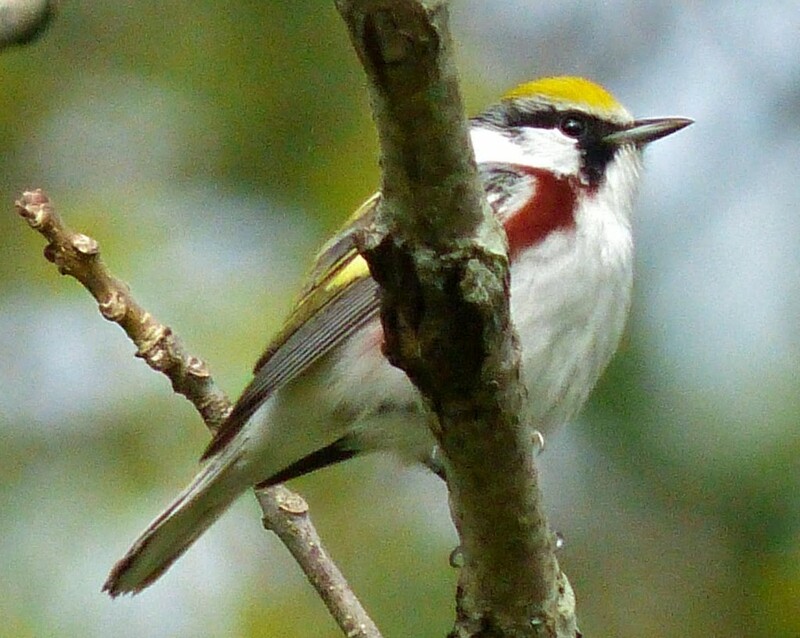 Even for experienced bird watchers, bay-breasted warblers are an unusual find. 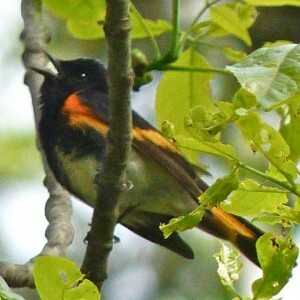 They are typically seen high up in tall trees, making good photos of them especially challenging. 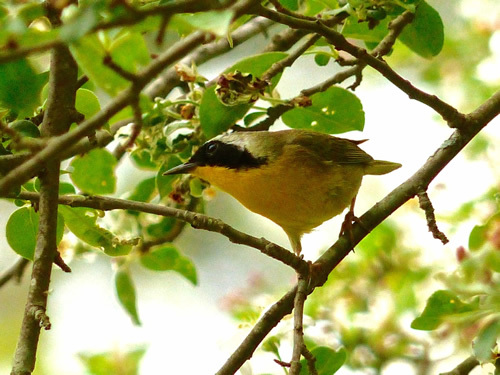 Populations of bay-breasted warbler appear to be decreasing throughout their range. 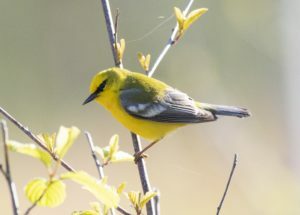 The U.S. has seen a decline of almost 3% per year between 1966 and 2014, resulting in a cumulative decline of 74%, according to the North American Breeding Bird Survey. Observation Location: in a tree at the edge of Lake Massapoag, near Beach St. 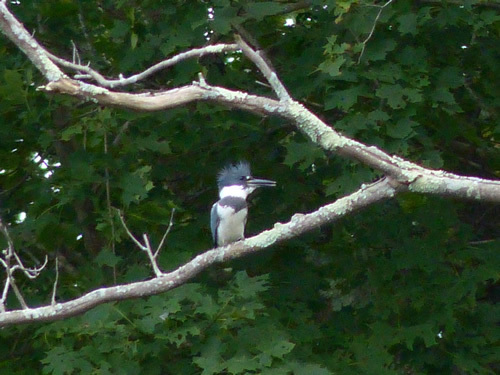 Comments: Kingfishers have also been sighted near the boat launch area and in the Gavins Pond area. They dive for small fish. They nest in burrows. Comments: A pair of belted kingfishers were diving simultaneously several times into Gavins Pond. 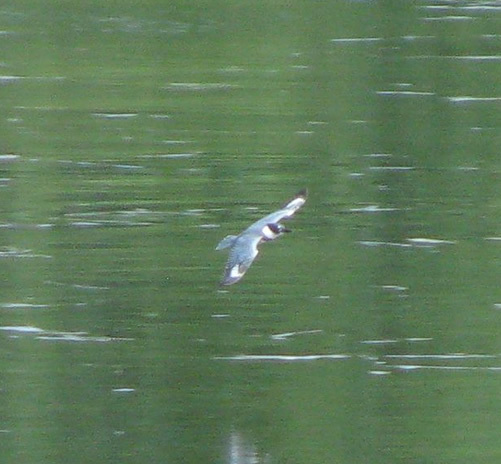 The bottom photo shows the splash of the kingfisher diving in. 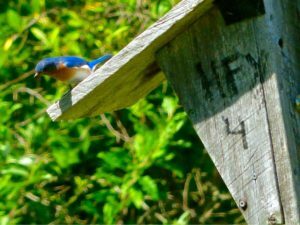 Kingfishers nest in burrows on the banks of ponds and rivers. Comments: These charismatic birds dive for fish. Believe it or not, they nest in burrows on the banks of streams and ponds. Comments: Black and white warblers are usually seen moving up and down tree trunks looking for bugs under the bark. 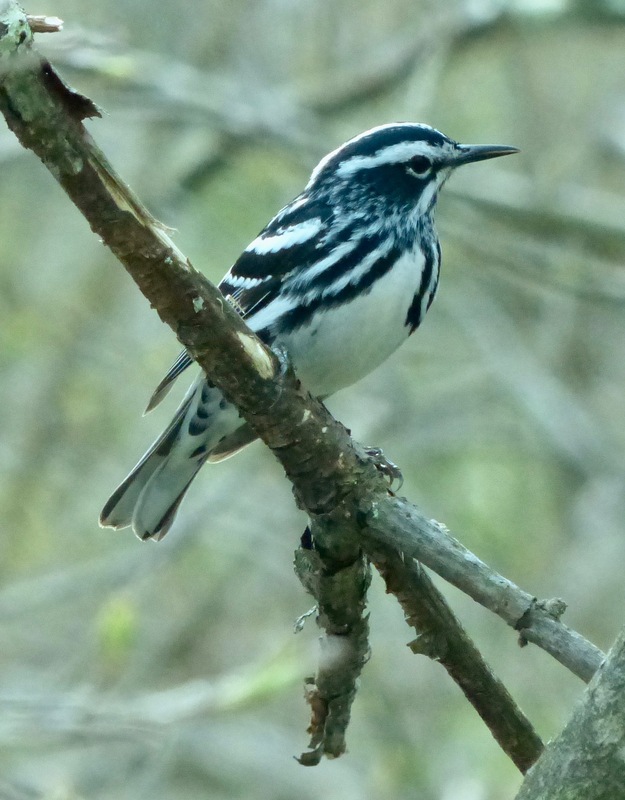 Comments: Black and white warblers creep along tree trunks and branches foraging for insects. Their high-pitched squeaky song sounds like a wheel turning that needs to be oiled. 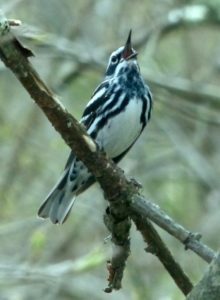 Comments: Unlike many other warbler species that migrate through Sharon on their way north, black-and-white warblers stick around all summer. 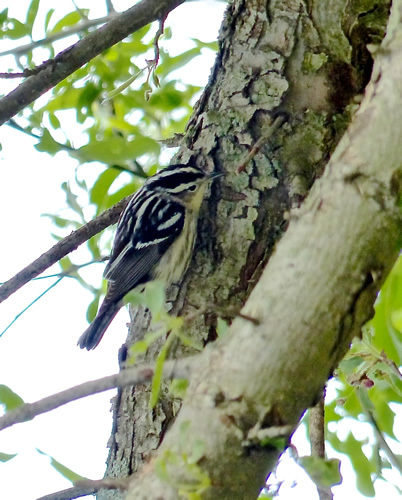 They are typically seen scurrying up and down tree trunks. Their high-pitched song sounds like a squeaky wheel. 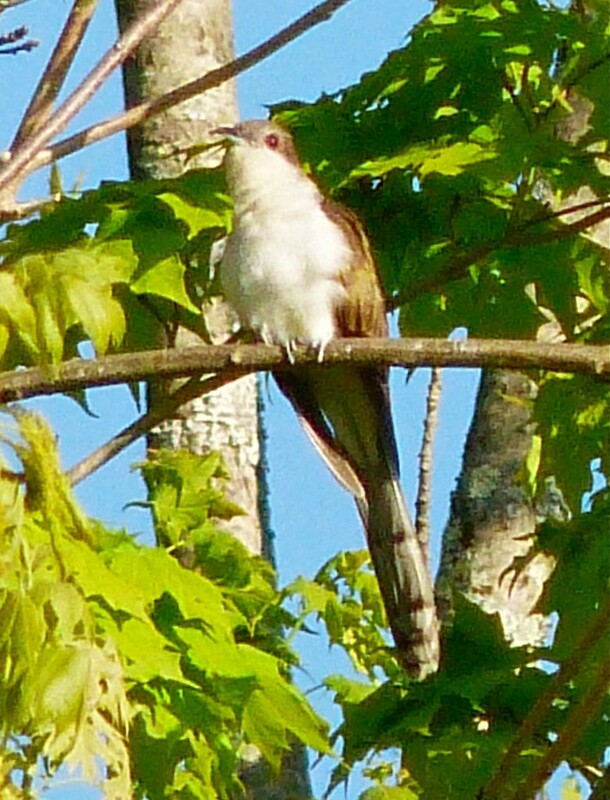 Comments: We heard this cuckoo before someone in our group spotted it. 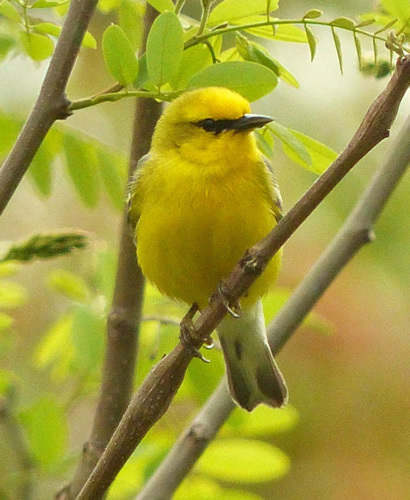 They tend to sit quietly on a branch, so the absence of movement makes them hard to find. 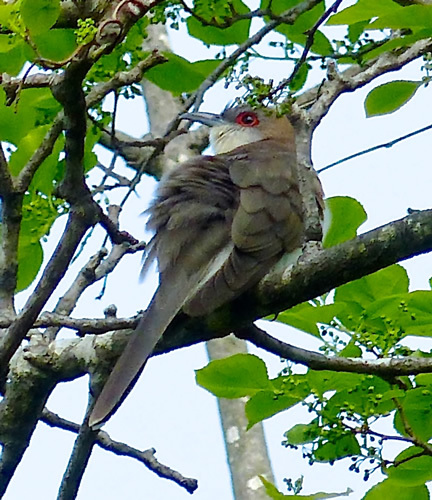 Black-billed cuckoos have distinctive red eyes. 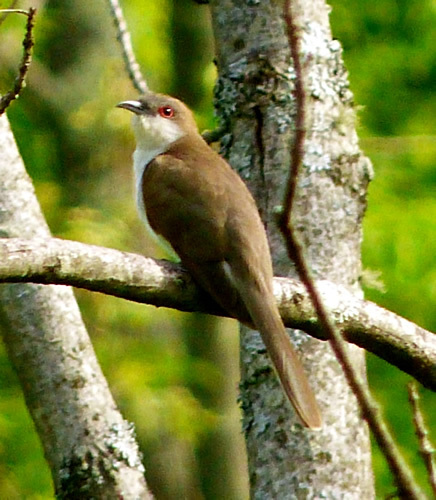 Comments: We heard this black-billed cuckoo before we finally spotted it. 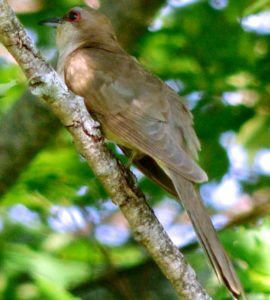 Even though cuckoos are relatively large birds, they typically don’t move around much, so they are hard to find unless you know what their call sounds like. 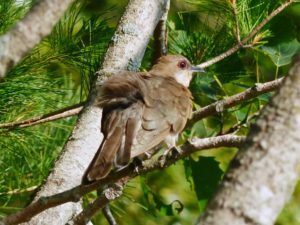 Comments: We heard this black-billed cuckoo before we finally spotted it. 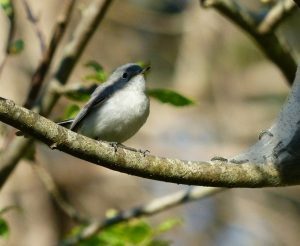 Even though cuckoos are relatively large birds, they typically don’t move around much, so they are hard to find, unless you know what to listen for. 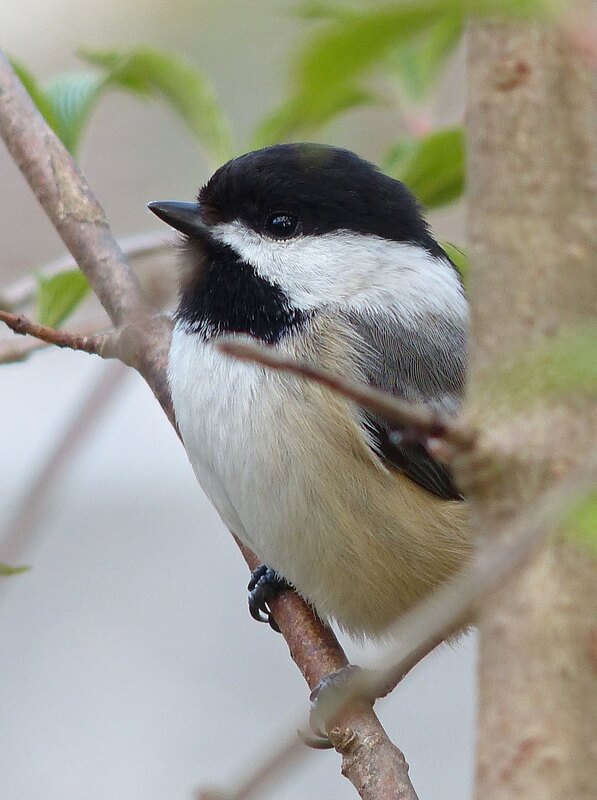 Comments: The chickadees were knocking the Pine Siskins off of the thistle feeders. 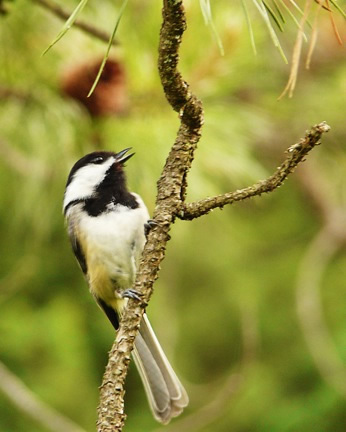 Comments: Chickadees are one of Sharon’s most common birds. 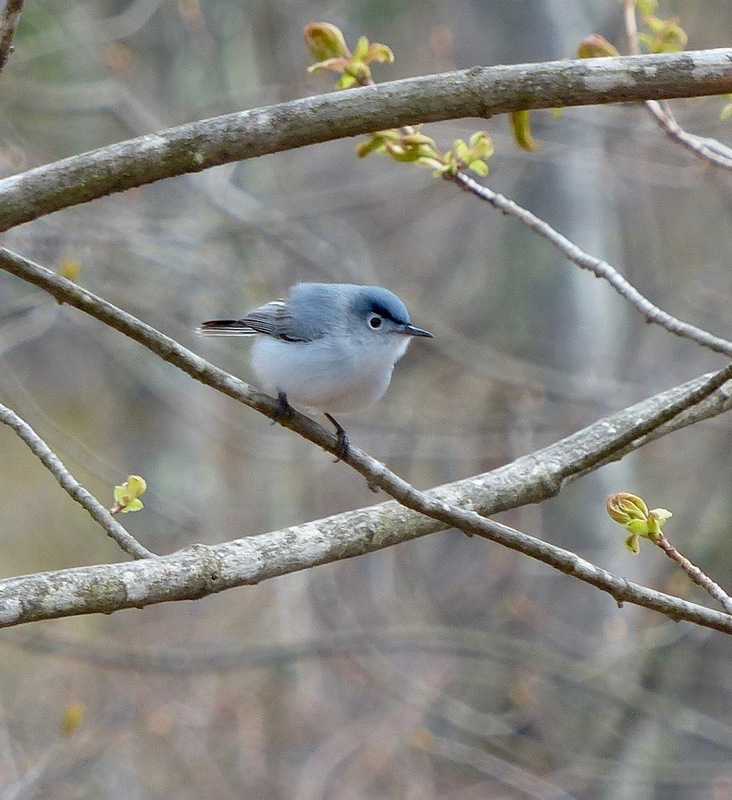 They often travel in groups that sometimes include tufted titmouse. 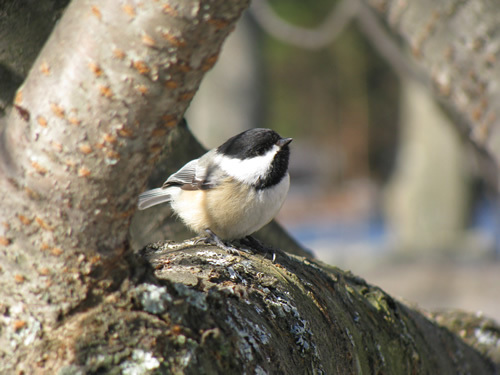 With patience, chickadees can be trained to eat sunflower seeds out of your hand! 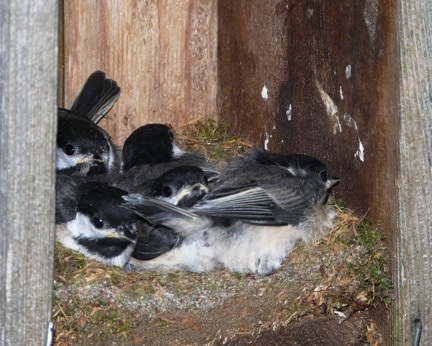 Comments: This chickadee family was crowded into a nesting box. Comments: The call of this warbler sounds like: “zee-zee-zee-zoo-zee.” It migrates through Sharon in May. 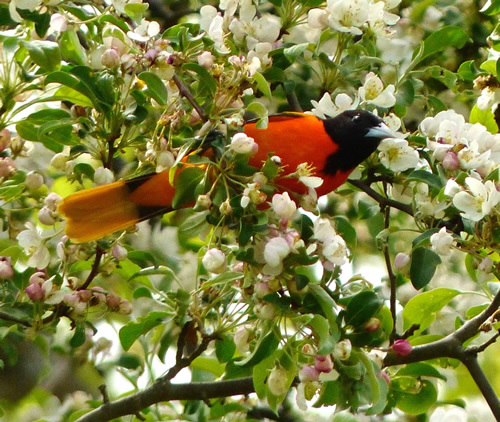 I got these photos standing underneath a flowering crabapple tree. 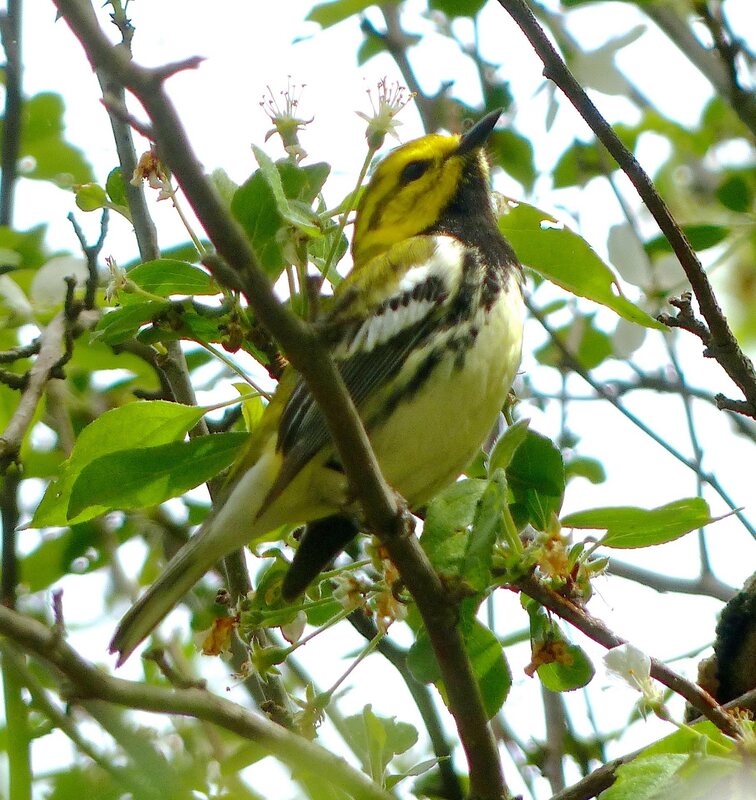 The blossoms attracted insects, which in turn attracted insectivorous warblers. 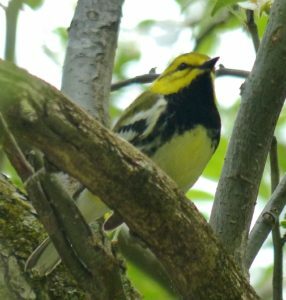 Comments: This photo does not do justice to these gorgeous warblers, which overwinter in South America. 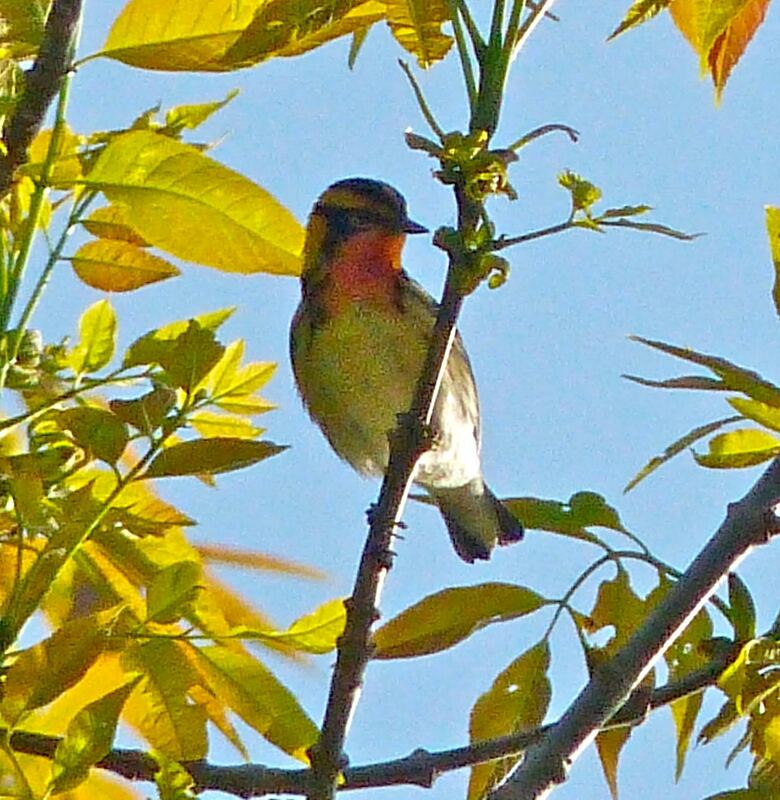 They tend to flit about high in tall trees, making them a challenge to photograph. 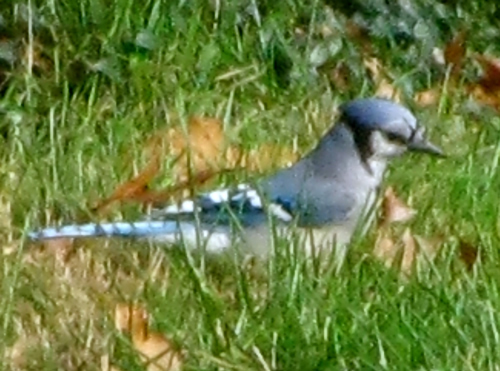 Comments: Blue Jays are common in Sharon. They eat insects and nuts. 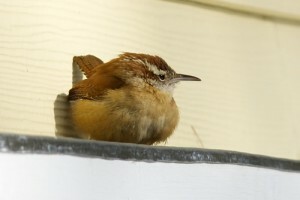 They will also eat the eggs and nestlings of other birds if they get the chance. They can live up to 17 years. 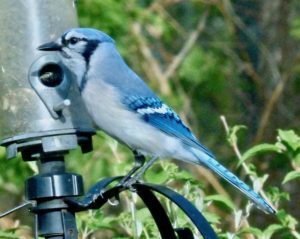 Comments: Blue Jays are common in Sharon. 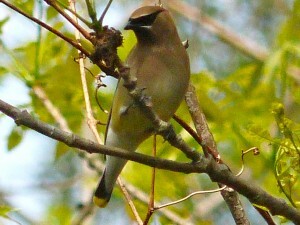 They eat insects, nuts and seeds. 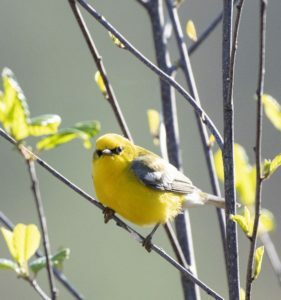 They will also eat the eggs and nestlings of other birds if they get the chance. They can live up to 17 years. 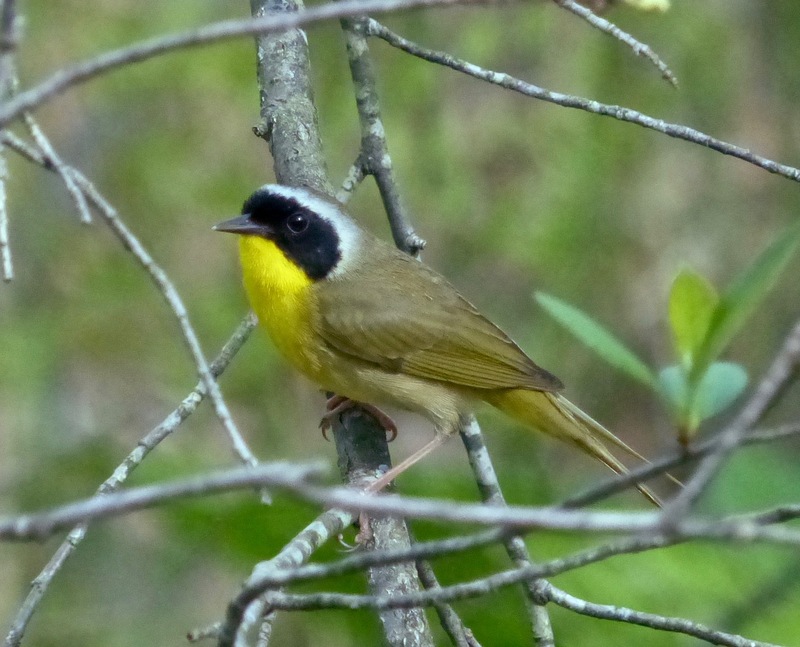 Their vocalizations are distinctive and varied. 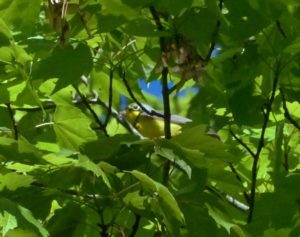 Observation Date: 5/1/18 at 8:15 a.m. 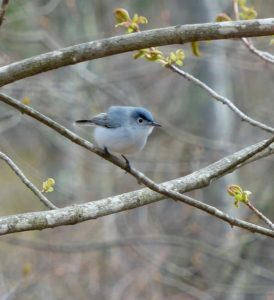 Comments: A tiny, long-tailed bird of broadleaf forests and scrublands, the Blue-gray Gnatcatcher makes itself known by its soft but insistent calls and its constant motion. 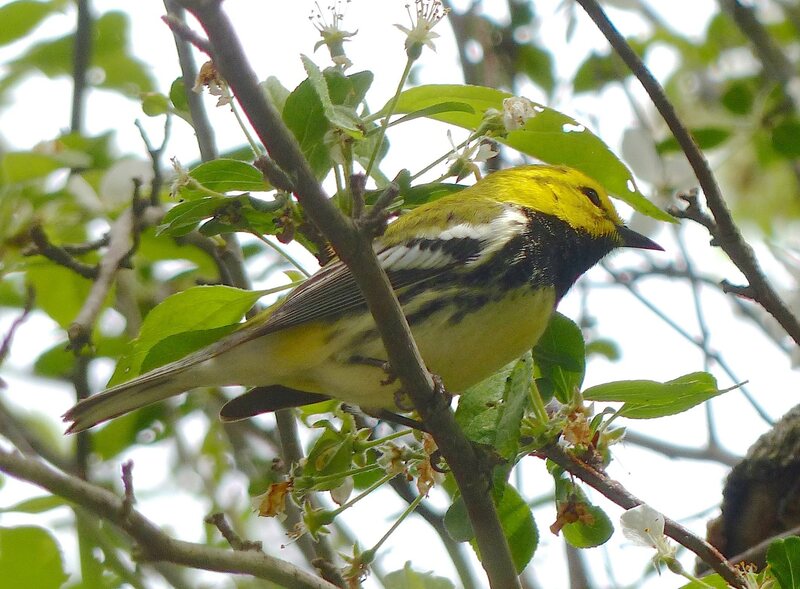 It hops and sidles in dense outer foliage, foraging for insects and spiders. As it moves, this steely blue-gray bird conspicuously flicks its white-edged tail from side to side, scaring up insects and chasing after them. 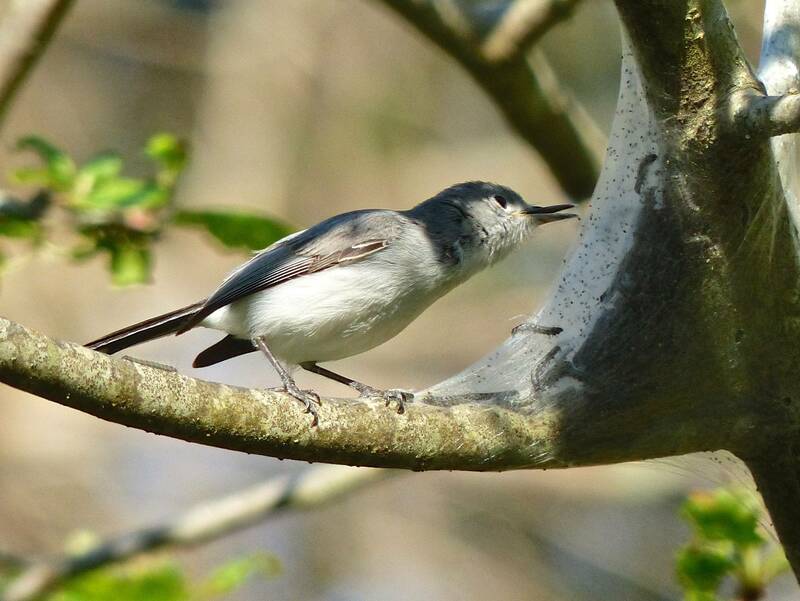 Pairs use spiderweb and lichens to build small, neat nests, which sit on top of branches and look like tree knots. 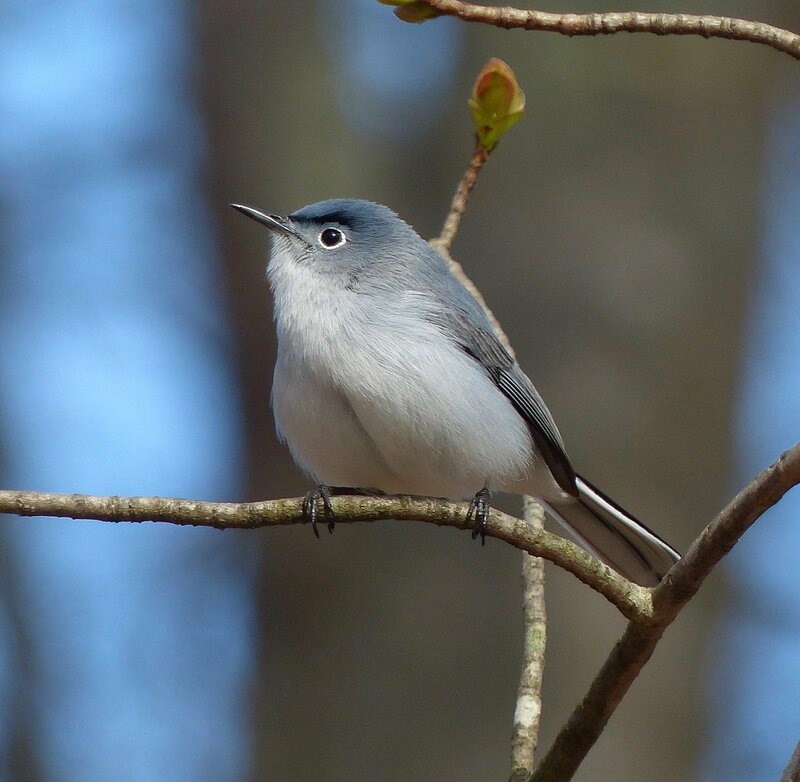 Comments: The blue-gray gnatcatcher is a tiny, long-tailed bird of broadleaf forests and scrublands. It makes itself known by its soft but insistent calls and its constant motion. 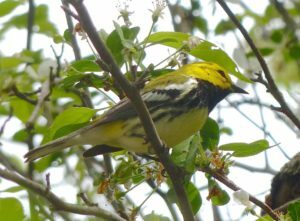 It hops and sidles in dense outer foliage, foraging for insects and spiders. 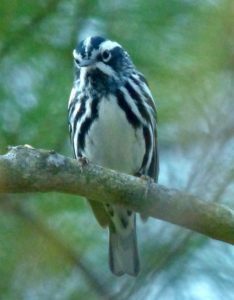 As it moves, it conspicuously flicks its white-edged tail from side to side, scaring up insects and chasing after them. 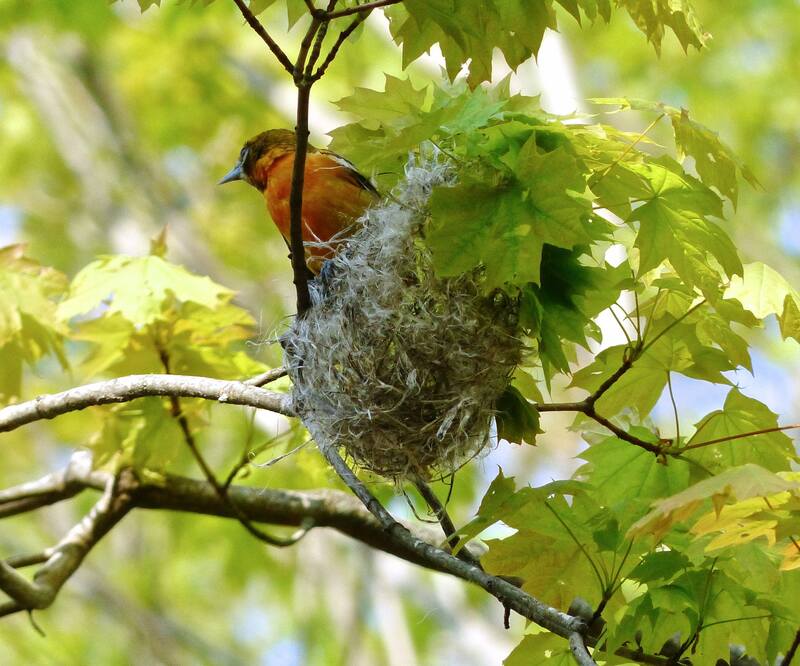 Pairs use spiderweb and lichens to build small, neat nests, which sit on top of branches and look like tree knots. 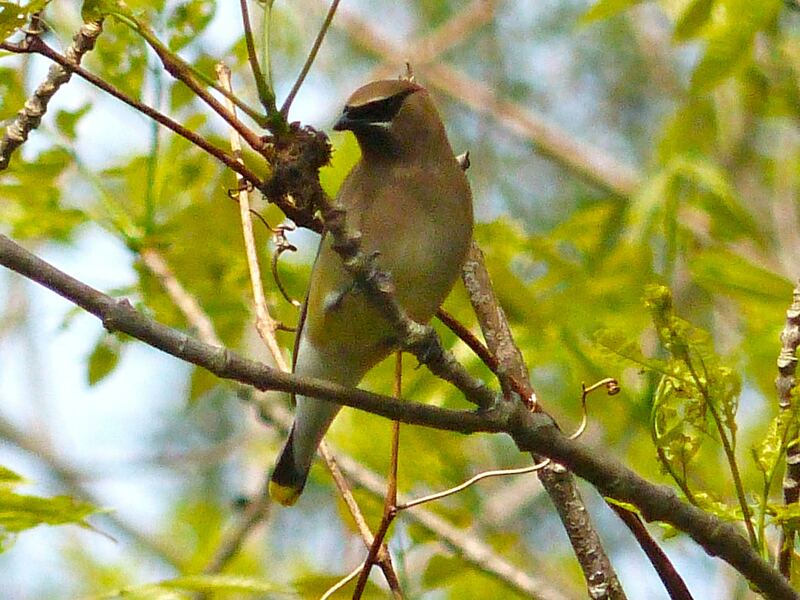 Note the tent caterpillars on the branch beside the bird. 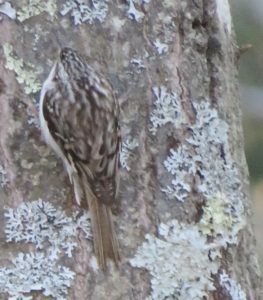 Comments: Brown Creepers are tiny woodland birds with an affinity for the biggest trees they can find. 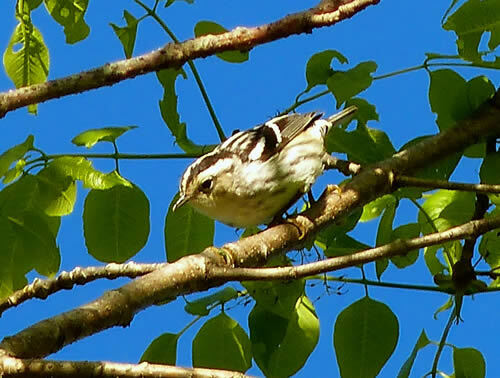 Look for these little, long-tailed scraps of brown and white spiraling up stout trunks and main branches, sometimes passing downward-facing nuthatches along the way. They probe into crevices and pick at loose bark with their slender, downcurved bills, and build their hammock-shaped nests behind peeling flakes of bark. Their piercing calls can make it much easier to find this hard-to-see but common species. Comments: Brown thrashers are one of the three mimics. 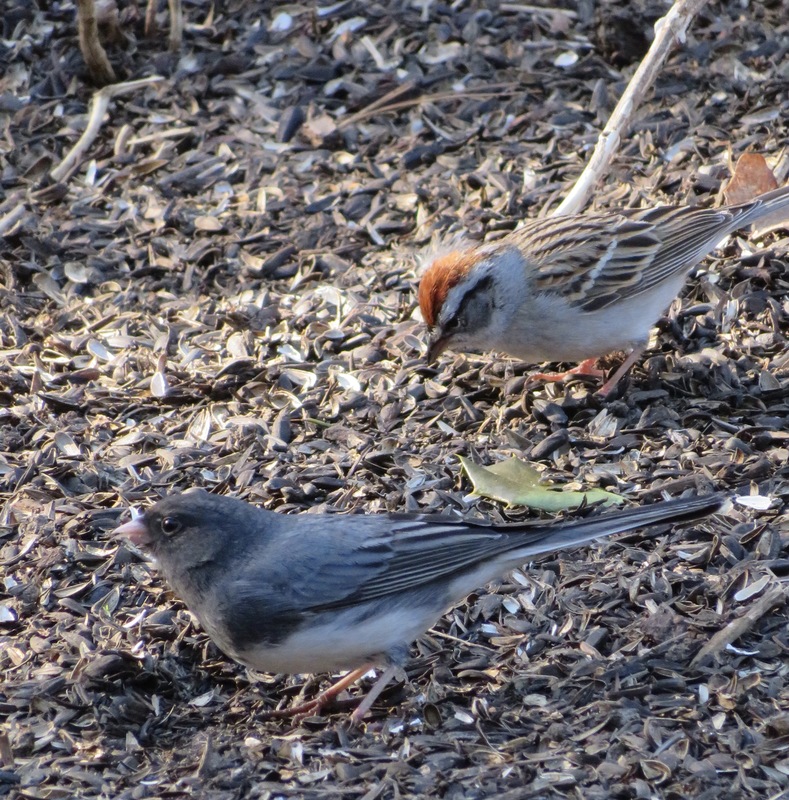 The other two are catbirds and mockingbirds. 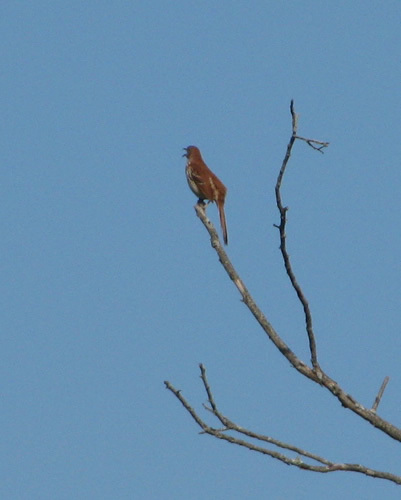 Brown thrashers repeat each vocalization twice. 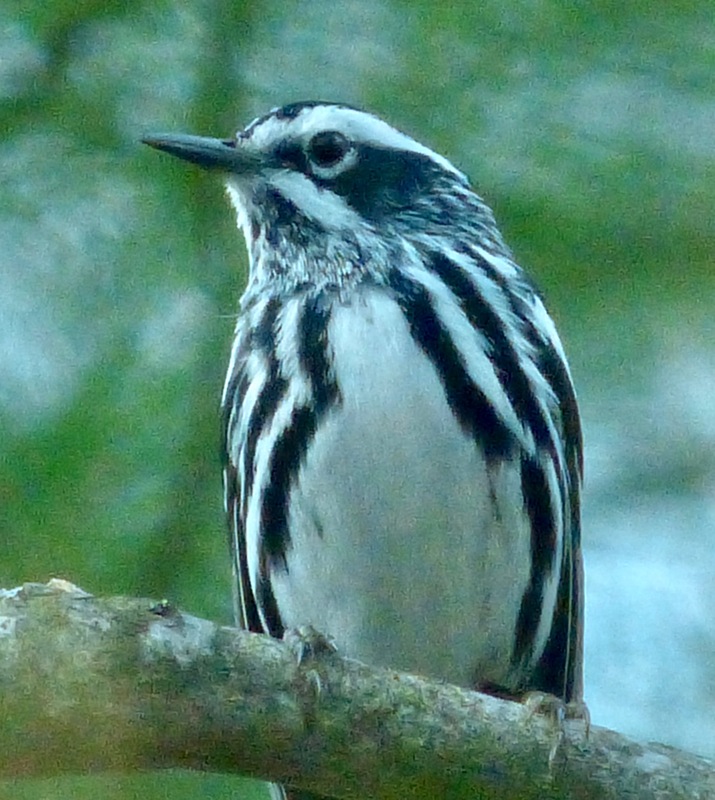 Mockingbirds repeat three or four times. 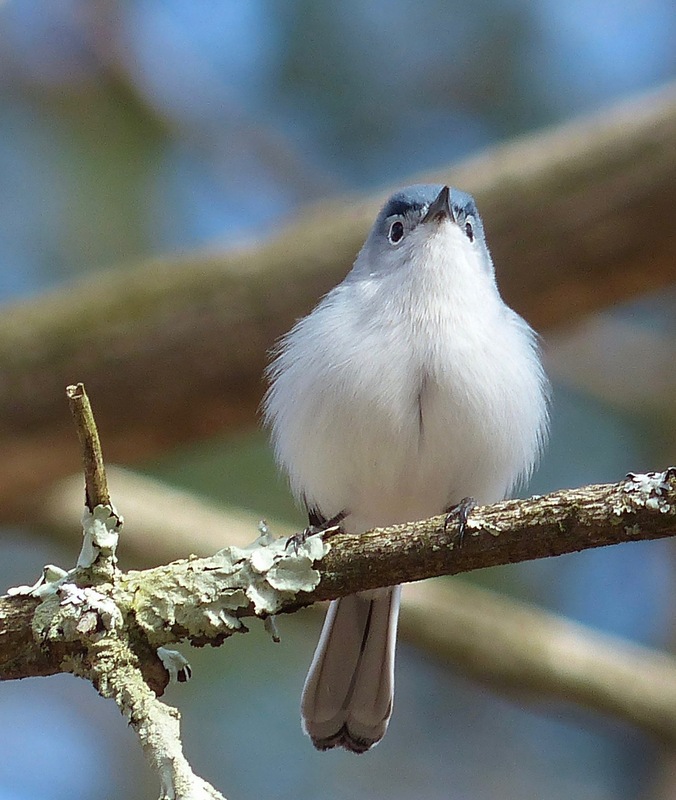 Catbirds only make each vocalization once. 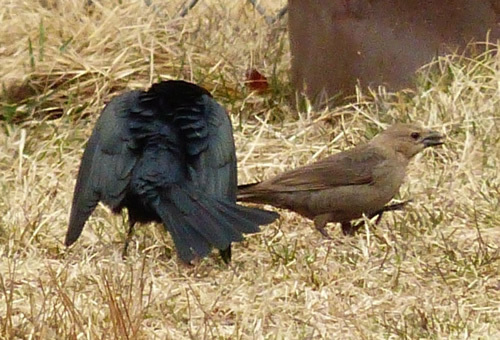 Comments: These Brown-headed Cowbirds were mating. 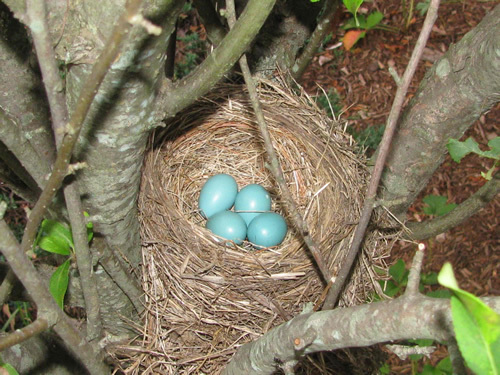 Cowbirds parasitize other bird species. 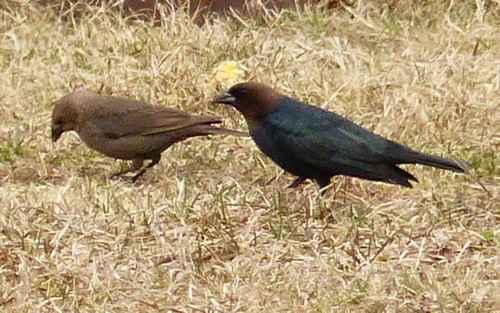 Female Cowbirds forgo building nests and instead lay their eggs in the nests of other birds, abandoning their young to foster parents, usually at the expense of at least some of the host’s own chicks. 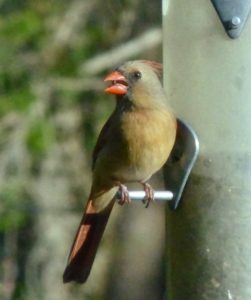 Once confined to the open grasslands of middle North America, cowbirds have surged in numbers and range as humans built towns and cleared woods. 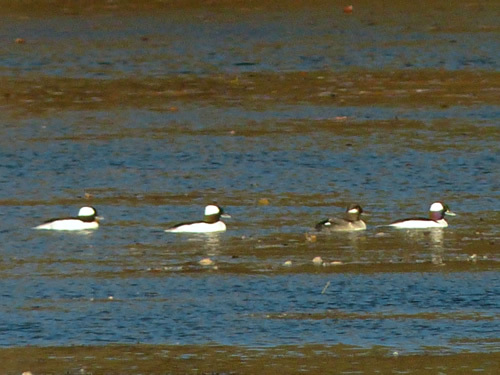 Comments: Buffleheads are small, diving ducks. They nest in old woodpecker holes, particularly those made by Northern Flickers, in the forests of northern North America. 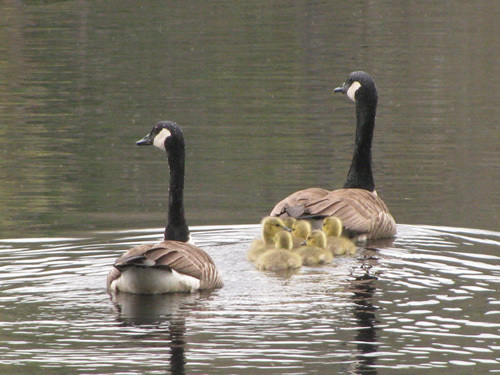 Comments: Canada geese are quite common in Sharon, and can even become a nuisance, but these goslings sure are cute. If you are in the mood for a heartwarming movie, see “Fly Away Home” about a girl who adopts some orphaned goslings. Comments: Canada Warblers migrate through Sharon in mid-May. 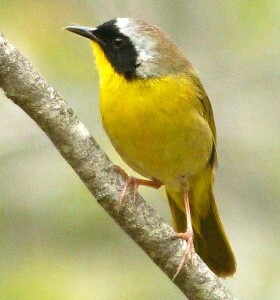 They have a distinctive black collar and a white eye-ring. Comments: This morning I saw a strange goose among the Canada geese at the Gavins Pond soccer field nearest to Gavins Pond Road. 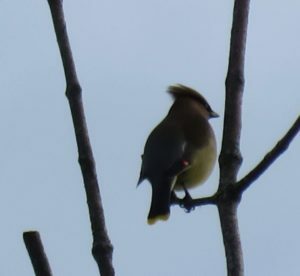 It had a distinct white line all the way around the base of its dark beak, light gray cheeks with a dark head and neck, and dull orange legs (the Canada geese had black legs). The transition from the gray cheeks to the dark head was not as sharp as that of the Canada geese, and the gray cheek patch was quite a bit larger than the white “chin strap” of the Canada geese. 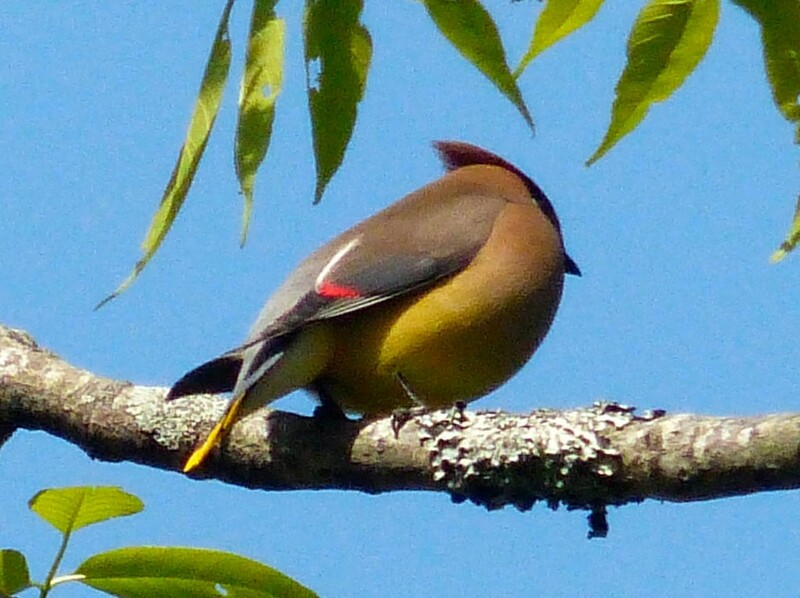 The body and rump were very similar to the Canada geese. 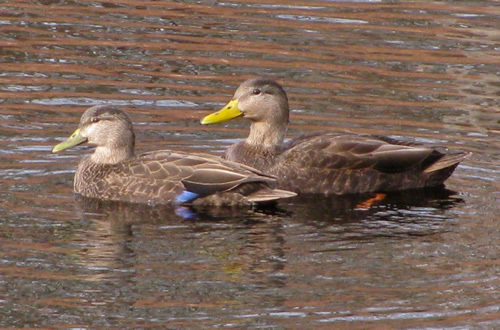 It looked like the some of the Canada x Greylag hybrids shown here except that it had a dark beak, and the white line around the base of the beak was more distinct. 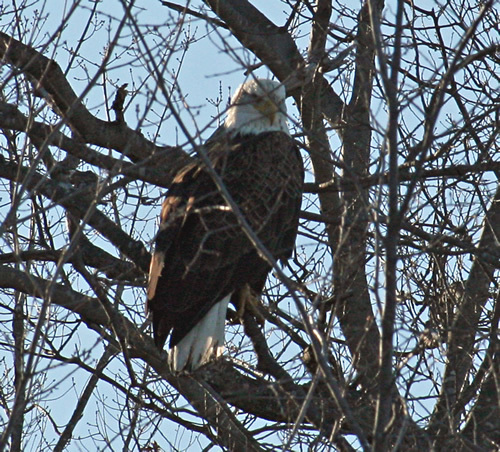 I watched it fly in alone and land on the field among the Canada geese, which is why I noticed it in the first place. 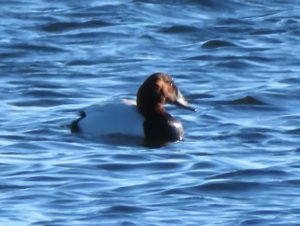 Comments: The species name of the Canvasback, Aythya valisineria, comes from Vallisneria americana, or wild celery, whose winter buds and rhizomes are its preferred food during the nonbreeding period. 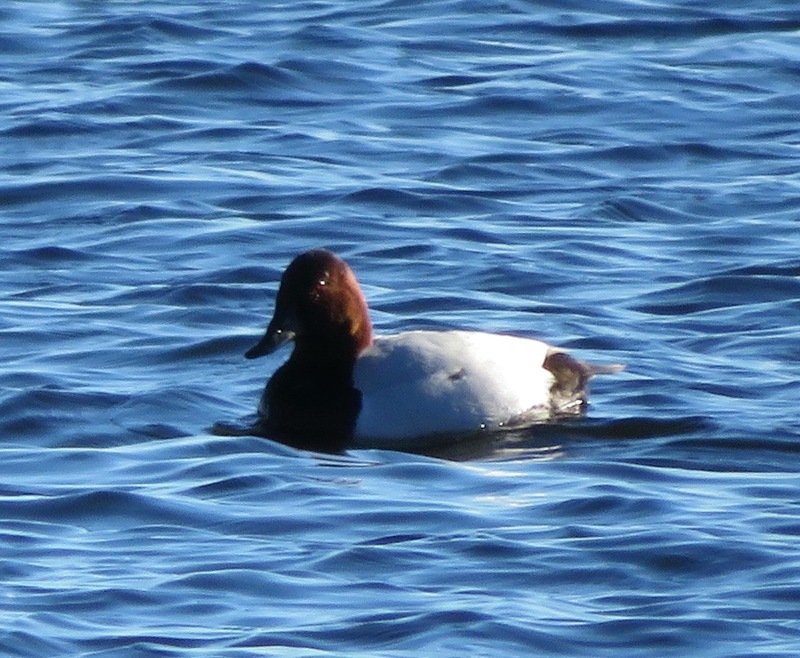 The oldest recorded Canvasback was a male and at least 22 years, 7 months old when he was shot in California in 1991. He had been banded in the same state in 1969. Comments: Cardinals are seen year-round in Sharon. 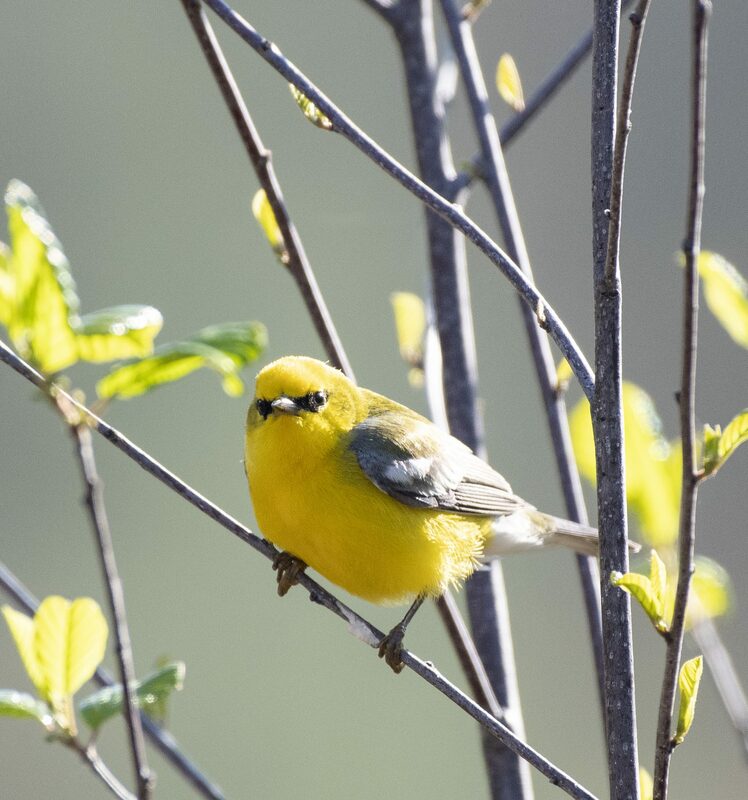 In springtime they defend their territories, sometimes hurling themselves against glass windows when they see their own reflections, thinking it’s a competitor. 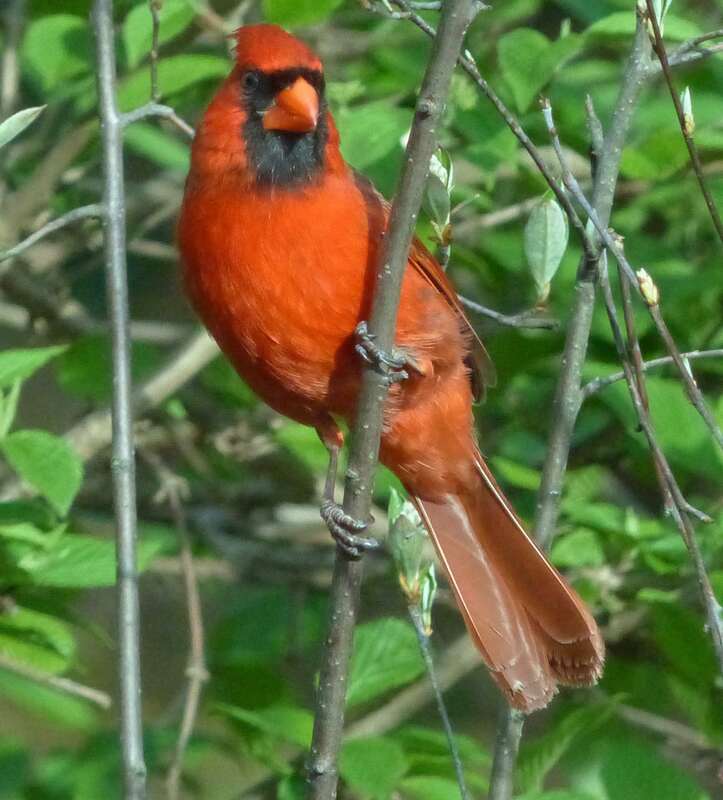 Cardinals typically travel in pairs. 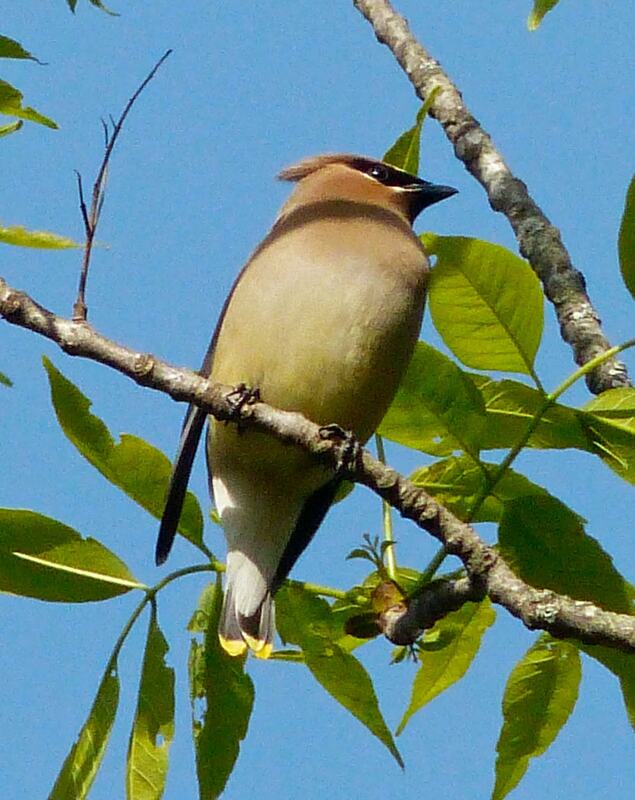 The female is mostly tan. 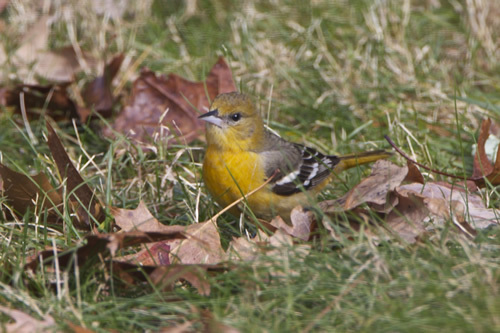 Comments: This and the titmouse and junco photos were all taken with a Canon 50D and a Canon 500mm f4 lens from the comfort of my kitchen on Moose Hill Parkway. We have feeders that attract lots of birds who land on a nearby lilac bush while waiting for their turn at the feeders. adjustments are made to exposure and contrast with sometimes a little extra sharpening applied. That and the nice, slanting winter sunlight are all there is to it. Comments: Following the SFOC walk on Martin Luther King Day (January 17), while sipping hot cider at Vera Cross’s house at about 3:40 p.m., a pair of Carolina wrens appeared out the window. It was only 20 degrees outside. 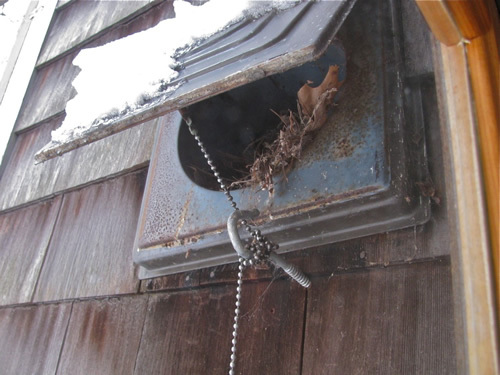 The wrens were flitting in and out of an old, unused flue, presumably trying to stay warm. 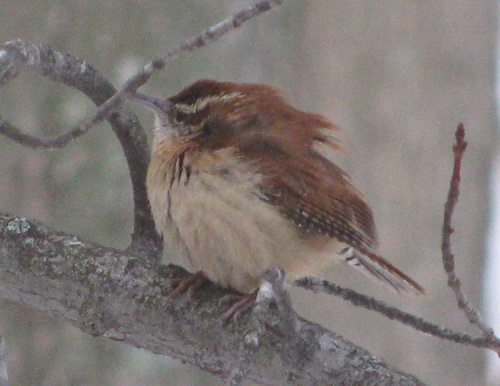 When they perched on a nearby branch, they fluffed their feathers for better insulation. range expansion seen in the late-1900s and early 2000’s. 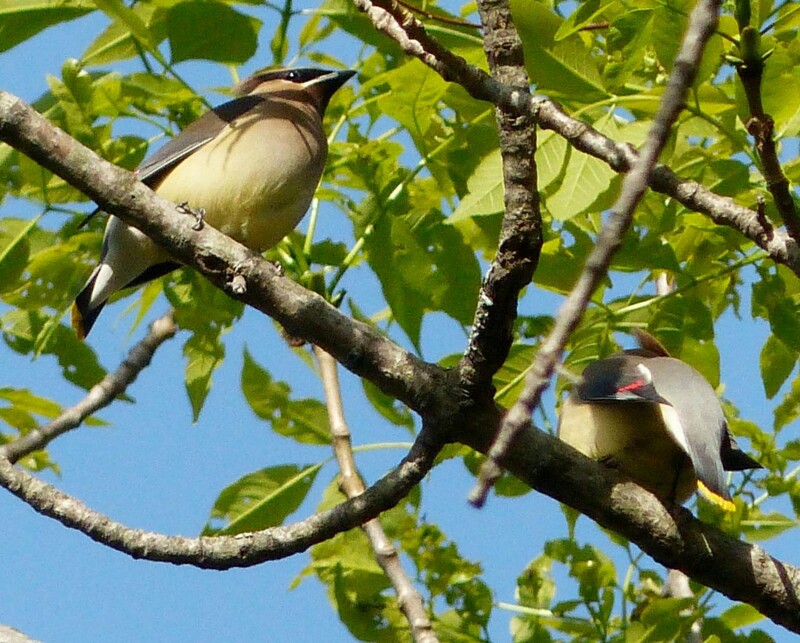 A pair bond may form between a male and a female at any time of the year, and the pair will stay together for life. Members of a pair stay together on their territory year round, and forage and move around the territory together. 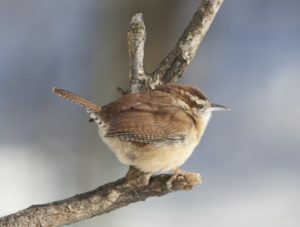 Comments: For more than 70 years, no Carolina Wrens were recorded during a Christmas Bird Count in Vermont. Then, in 1975, two were spotted. After being observed sporadically on subsequent counts, the bird began making regular appearances in 1991, and its numbers increased steadily from 1999 to 2006. 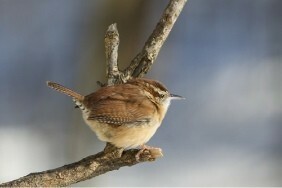 Once a southern species seen rarely during New England’s traditionally cold winters, the wren is now a regular. And it’s not alone. 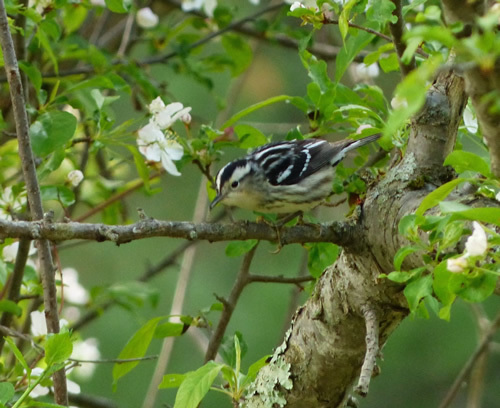 Milder winters and the earlier onset of spring have spurred a variety of species to spread their wings farther north, including Tufted Titmouse, Red-bellied Woodpecker, and Cape May Warbler. 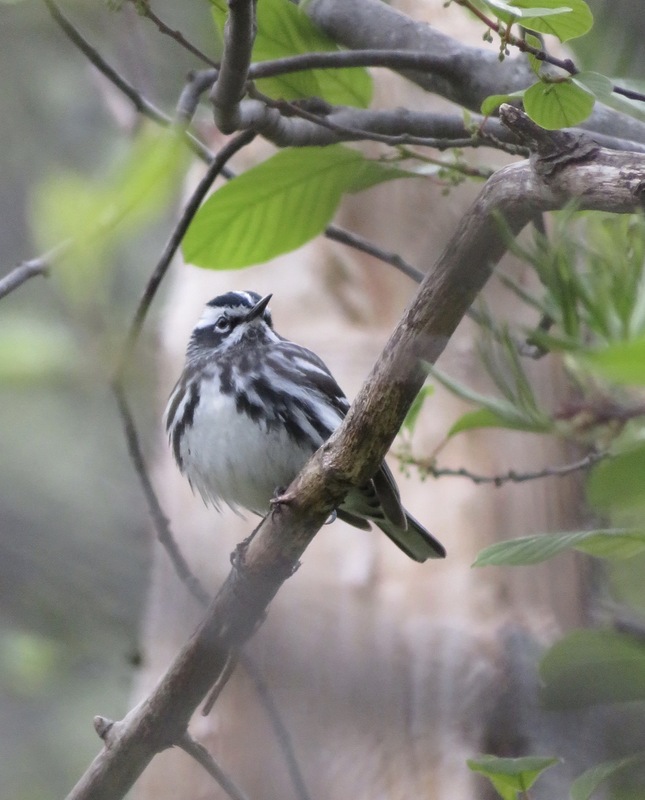 Comments: Dazzling woodland warblers migrate through Sharon every spring on their way from South and Central America to Canada. 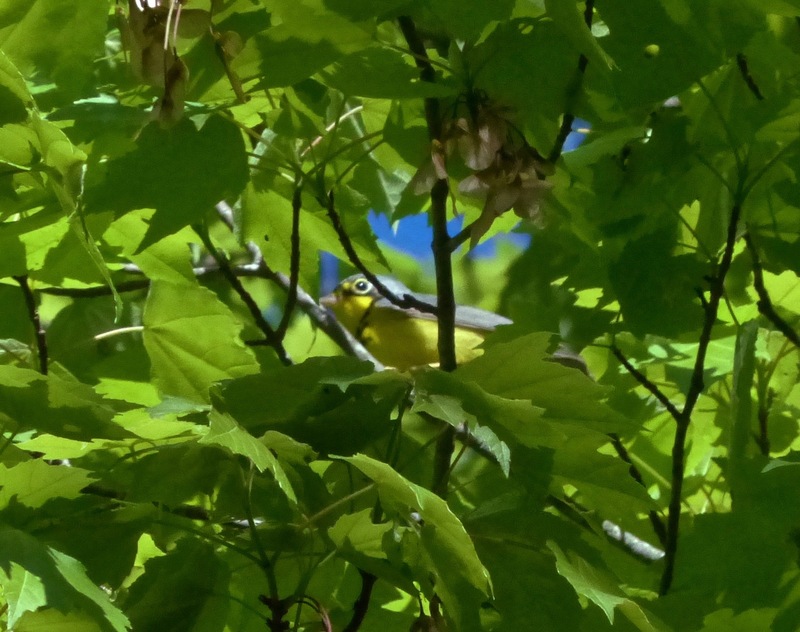 Catching sight of one leaves an indelible impression. 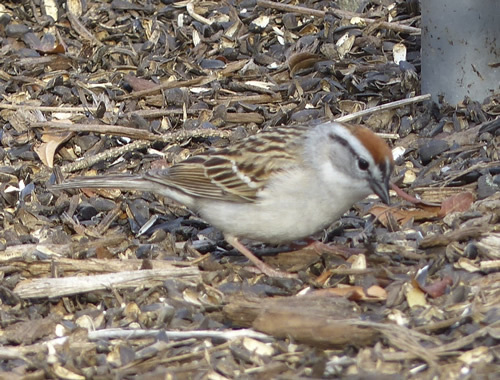 Comments: Chipping sparrows are very common in Sharon. 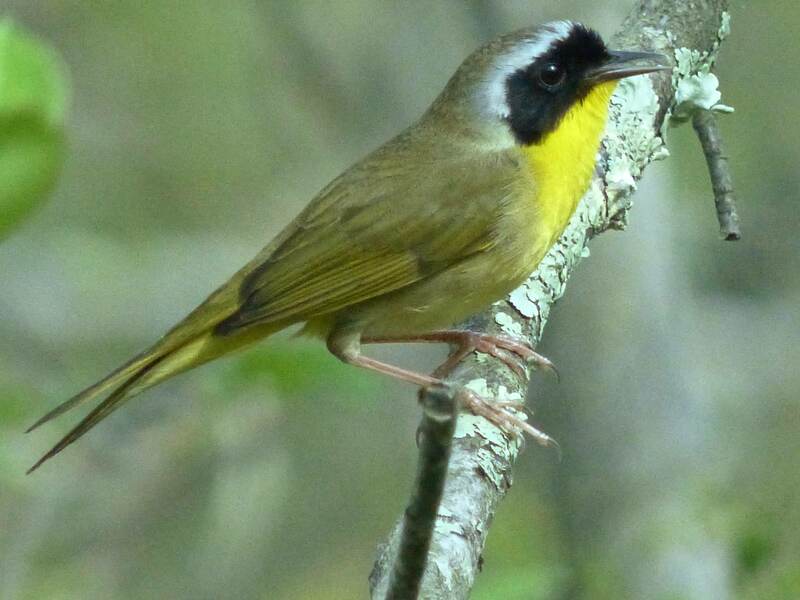 They have a distinctive reddish cap above a white eyeline. 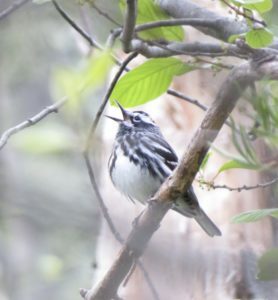 Their song is described as a reedy trill that sounds a lot like the songs of the pine warbler and the junco. 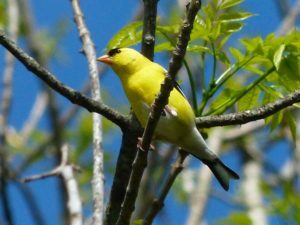 Comments: If you want to get an idea of what birds are around, spend some time watching the feeders at the Moose Hill Audubon Wildlife Sanctuary. 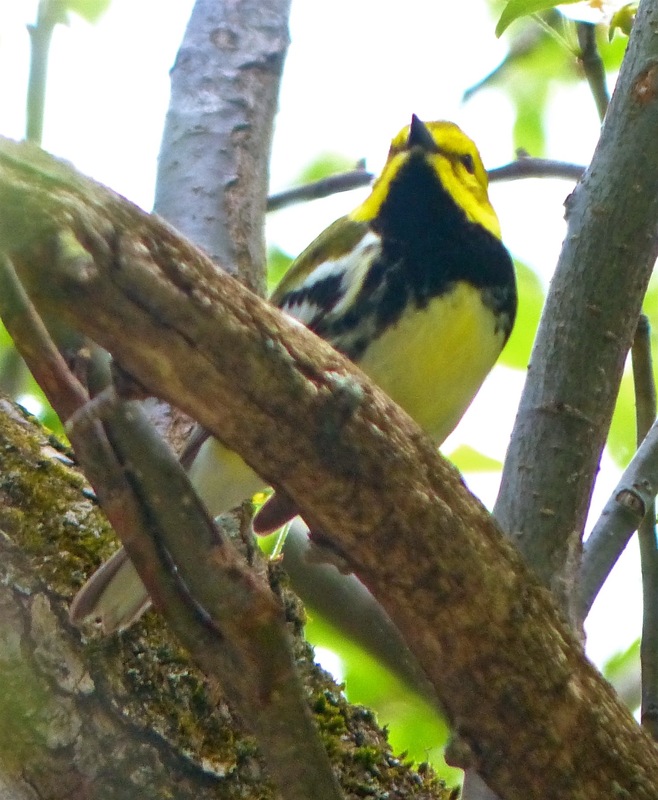 You’ll see everything from hummingbirds to wild turkeys. Comments: Common Mergansers are sometimes called sawbills, fish ducks, or goosanders. 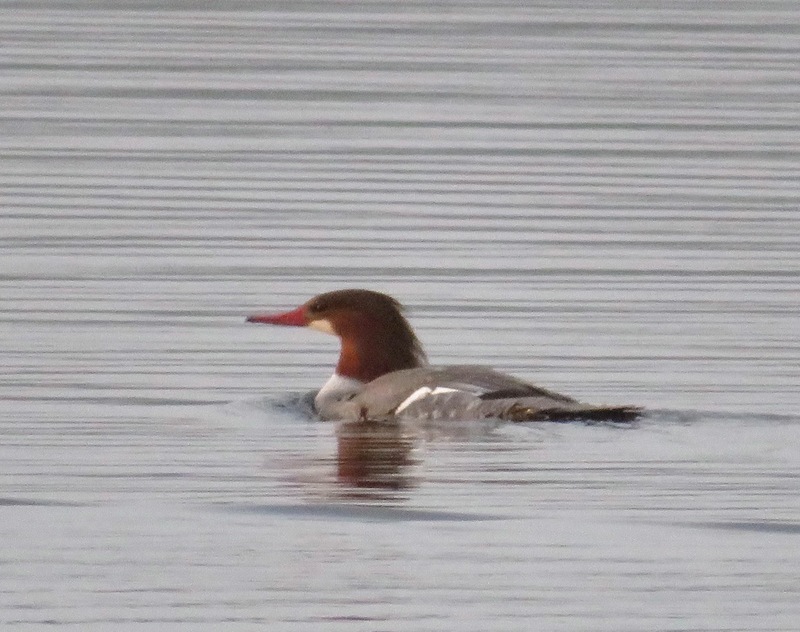 The word “merganser” comes from the Latin and roughly translates to “plunging goose”—a good name for this very large and often submerged duck. 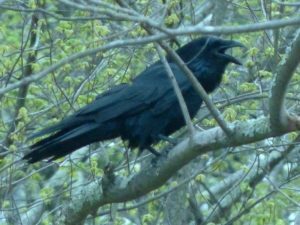 Comments: Ravens are considerably larger than crows. 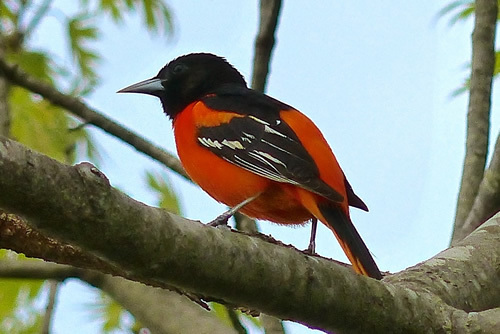 Their call is different and they travel in pairs, unlike crows, which travel in larger groups. For more information, see: http://www.audubon.org/field-guide/bird/common-raven. Sharon is at the southern edge of the raven’s range. 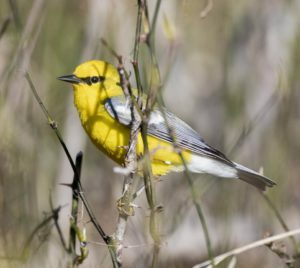 Be sure to scroll down and check out the map showing how the raven’s range is expected to retreat northward as the climate heats up. Comments: This masked warbler is typically found near wetlands or ponds. 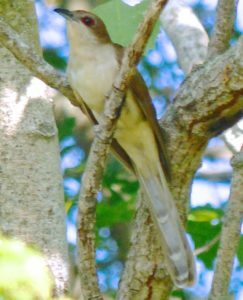 Comments: This juvenile female Cooper’s hawk alit in the dogwood tree right outside my living room window as I was working at my desk. 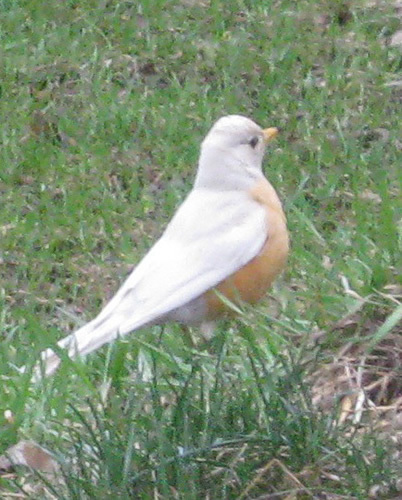 Without getting up, I reached for my camera and snapped this photo through the window just before it flew away. 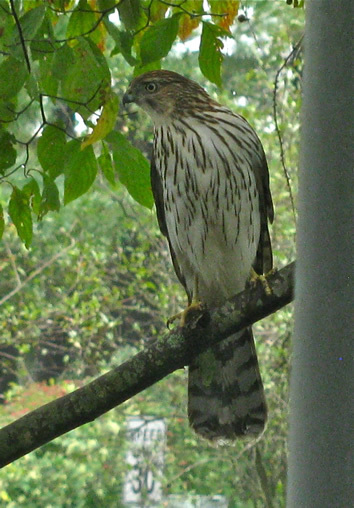 Cooper’s hawks look like Sharp-shinned hawks, but Cooper’s hawks have a more rounded tail. Also, the streaks on the breast of a juvenile Cooper’s hawk are narrower than those on the breast of a sharp-shinned hawk.